Longtime U.S. Rep. Walter B. Jones Jr., a Republican known for an independent streak that put principle before party, died Sunday at his home in Greenville. He was 76. “Congressman Jones will long be remembered for his honesty, faith and integrity,” a statement on his website said. “He was never afraid to take a principled stand. He was known for his independence, and widely admired across the political spectrum. The 12-term, 3rd District congressman had been in failing health since July and his conditioned worsened after he suffered a broken hip in January. On Jan, 26, his office said he was under hospice care. 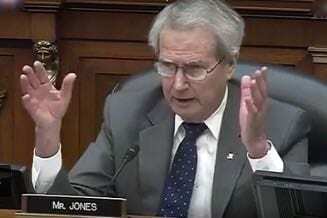 “Congressman Walter B. Jones Jr. was the true embodiment of a public servant. He will be long remembered for his tireless advocacy for Eastern North Carolina, which he loved dearly, and for always following his convictions, no matter the political cost,” U.S. Sen. Thom Tillis, R-N.C., said in a statement. Jones was first sworn in to the U.S. House of Representatives in 1995, following 10 years as a member of the North Carolina General Assembly. “Jones’ legacy will undoubtedly be the unequivocal advocacy he put forth for the men and women who serve in this country’s armed forces, and not just those who lived in his district, but across the nation,” North Carolina Republican Party Chairman Robin Hayes said in a statement.